People ask me pretty often what it’s like living in Las Vegas. I’m a city guy but I imagine living 20 minutes from the strip is what like living the suburbs anywhere would be like. Everything around me is a strip mall, casino, golf course or desert. It’s much less intense than I’m used to and I like that. Oh yeah, I have about 15 coffee shops within a mile of my house. Las Vegas is a transient city and many people just stay here for a short while so people come and go fairly quickly. I was talking with someone a couple of weeks ago about having a local bar. A bar like the TV show “Cheers”, where everybody knows your name. Last weekend I realized that my local bar is the sportsbook bar at Red Rock Casino. 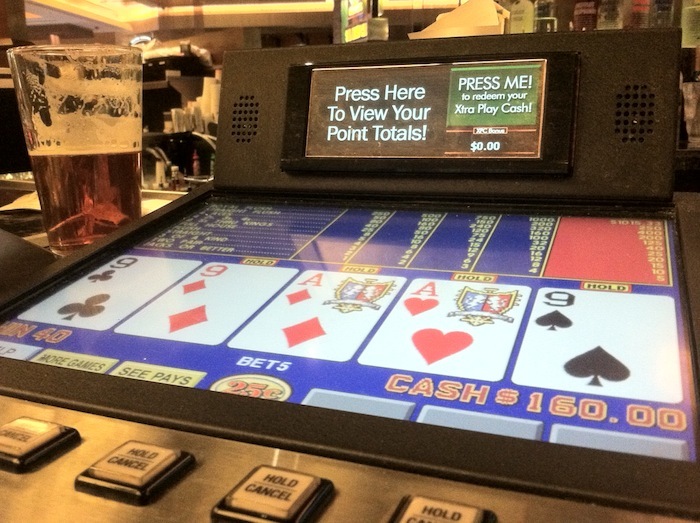 During baseball season I’m there a few days watching the games, playing video poker and having a couple of beers (Usually Kona Fire Rock). I usually have my head buried in my iPhone or on one of the games in front of me and I’m not very social but the bartenders have been the same people since I moved here and they’re always nice. Last week one of the bartenders started a conversation making fun on the fact that I wasn’t wearing my New York Yankees hat for a change. The quick exchange reminded me that the bartenders at that bar know about half the people who visit. That seems like a lot of people for a casino bar. There are plenty of bars in this area but that’s my favorite because of the access to watching so many games. A pint of Fire Rock Pale Ale is only $3 and they have daily drink specials like most bars. Even if we don’t chat much because I keep myself busy I always feel like I’m at the bar I should be and there’s something comforting about that. I just realized that the picture above took was taken while we were talking about the Yankees. Play Ball! Not Slot Machines. Pitchers and catchers report to MLB spring training today! Baseball fans, like me, love this day. Not only does it signify that nice weather is around the corner but so is baseball season. 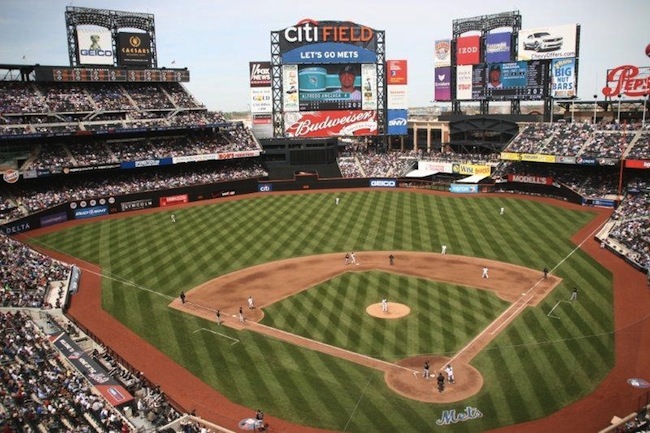 One of the newest baseball stadiums, Citi Field home to the New York Mets, was originally proposed to house a casino. Alas, that fell through. The owners of the New York Mets reportedly wanted to take a gamble on owning a casino next to Citi Field, the home of their major league club. Sterling Equities, the real estate company operated by Mets owner Fred Wilpon and family, pitched a casino adjacent to the major league stadium in September 2011 and offered the City of New York $100 million to acquire 62 acres for the site, the New York Post reported Tuesday. It’s a shame that building a casino to go along with Citi Field fell through. It wouldn’t have been a full casino since casinos in New York City aren’t allowed to have table games yet. This casino would just have slot machines and video poker but it would have combined two of my favorite things in the world baseball and casinos. It would give this Yankees fan an excuse to check out a new baseball stadium even if it meant sitting through the Muts. There’s more on the potential of a Queens casino at the New York Post. If you read my writing enough, you’ll know I love coffee and I go to coffee shops to write pretty often. A couple weeks ago I was craving a hazelnut latte and there’s only one place I’d get that from – Sambalatte. Besides having the best coffee in Las Vegas, Sambalatte makes great flavored latte’s because they only gently flavor the drinks. Most places add too much syrup and overpower the latte. Of course, they’re usually trying to hide their mediocre coffee. Sorry to digress, I just love Sambalatte and encourage any coffee lover in Vegas to stay away. It’s small and crowded. I need my space. 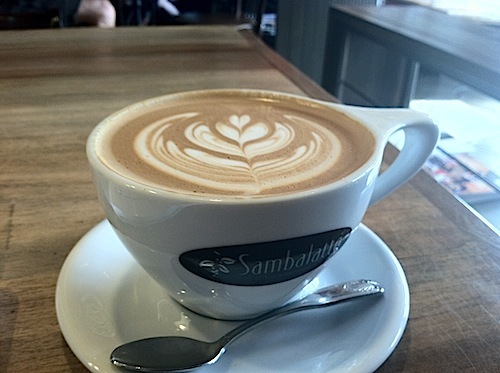 Seriously, you should go to Sambalatte…It’s awesome. Back to “High Rollers”. I was writing up a couple entries for Get Vegas Apps when a TV crew walked into Sambalatte. They were hanging signs and warning customers that they would be shooting a reality TV show in a little while, so if we didn’t want to appear on the show we should leave. The production crew didn’t know the name of the show, but said it would be like Real Housewives of Vegas. A little research showed me that the show would be called “High Rollers” and would feature poker pro Jenn Harmon and some rich broads. I’ve been on TV before so I wasn’t bothered. At minimum I’m in the background of the deep conversation the show (photo above), but who knows. If you want to find me look for the guy in the NY Yankees hat when the show airs on TLC next year.